Many people did not grow up in a Christian home, and many more do not consider their childhood experience a good model. Robert Wolgemuth presents this inspiring, practical book for people who want to have a Christian home.^So, what's so great about a Christian home? There's redemption. There's forgiveness. There's hope. Laughter and genuine happiness. There's discipline and purpose there. And there's grace . . . lots of grace.^The Most Important Place on Earth covers eight answers to the question ?What does a Christian home look like?? It's filled with stories and practical ideas that will convince any reader that a Christian home is not an illusive stereotype. It's something that really can be achieved. And it's something worth having. You?ll see. - Publisher This book explains what a Christian home looks like and how you can have one of your very own. It's filled with stories and practical ideas that will convince you that a Christian home is not an illusive stereotype. It's something that really can be achieved. And it's something worth having. You'll see. Building a Christian home requires planning. Urgency. Focus. Purposefulness. Intentionality. But it's worth it. For this is the place where life makes up its mind. The Most Important Place on Earth provides the blueprints. Combining the heart with the how-to, author Robert Wolgemuth draws from his experiences as both a father and a son to explain how your home can become a place of happiness and refuge. Hands-on and practical, this book includes "The Family Vitamins"-important words that every family member needs to say to stay healthy. Wolgemuth provides a fresh perspective on discipline-teaching your children the joy of self-denial and moderation. The complete plan to build your own Christian home is here, along with specific advice on other subjects such as making the kitchen the center of your home and treating each other like valued customers. The results, Wolgemuth says, will produce permanent and positive impressions not only on your children, but also on you and your neighbors. A well-constructed Christian home requires work. After all, your home is the most important place on earth. Book jacket. 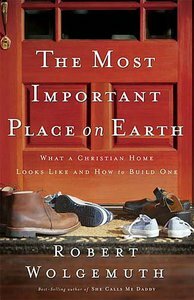 About "The Most Important Place on Earth"
This book explains what a Christian home looks like and how you can have one of your very own. It's filled with stories and practical ideas that will convince you that a Christian home is not an illusive stereotype. It's something that really can be achieved. And it's something worth having. You'll see. Building a Christian home requires planning. Urgency. Focus. Purposefulness. Intentionality. But it's worth it. For this is the place where life makes up its mind. The Most Important Place on Earth provides the blueprints. Combining the heart with the how-to, author Robert Wolgemuth draws from his experiences as both a father and a son to explain how your home can become a place of happiness and refuge. Hands-on and practical, this book includes "The Family Vitamins"-important words that every family member needs to say to stay healthy. Wolgemuth provides a fresh perspective on discipline-teaching your children the joy of self-denial and moderation. The complete plan to build your own Christian home is here, along with specific advice on other subjects such as making the kitchen the center of your home and treating each other like valued customers. The results, Wolgemuth says, will produce permanent and positive impressions not only on your children, but also on you and your neighbors. A well-constructed Christian home requires work. After all, your home is the most important place on earth. Book jacket.